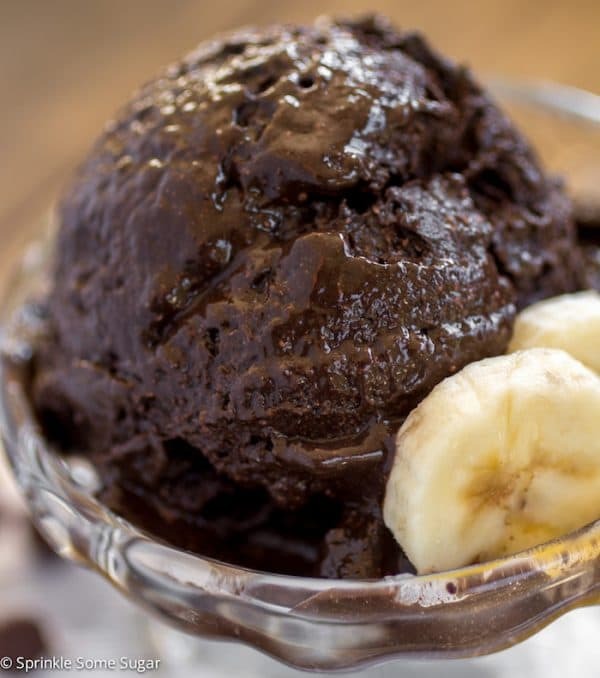 Dark Chocolate Banana Ice Cream - Chocolate Chocolate and More! 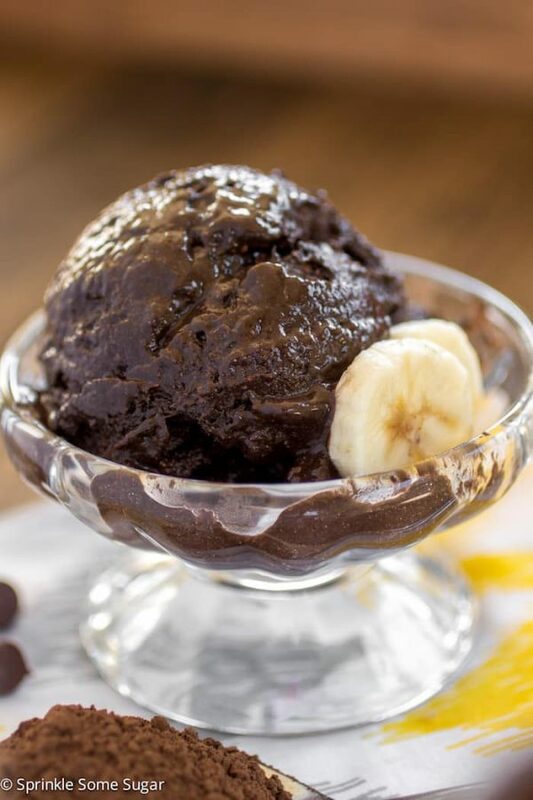 This Dark Chocolate Banana Ice Cream is one of my favorite recipes to make when I’m trying to eat better and want to feel like I’m eating a treat. Ice cream is my favorite so when I can have something that tastes like it’s a treat but is secretly healthier, I’m all for it! I’m sure you have all heard of banana ice cream before. Ya know, when you freeze bananas, pulse them in the food processor and it makes the creamiest concoction ever. Pretty much like soft-serve ice cream. It’s awesome. As long as you have the frozen bananas on hand, this ice cream comes together so quickly. I like to add some dark cocoa powder, chocolate chips, agave (or honey) to sweeten it a bit and a little bit of chocolate almond milk – or you can use regular chocolate milk. The flavor is so amazing! Like a chocolate covered banana. Everything gets pulsed in the food processor and turns into a creamy dreamy treat. 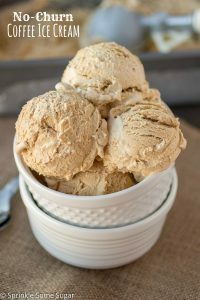 You can eat it just like that for a soft-serve kind of ice cream, or you can put the mixture into a freezer-safe container and freeze it for a scoop-able consistency (pictured). Add bananas to a large food processor and pulse until creamy and smooth. Add cocoa powder, chocolate chips and almond milk and pulse again until fully combined. Add agave one tablespoon at a time until the desired sweetness is achieved. You can eat it like this for a soft-serve texture or you can spoon it into a freezer-safe container and freeze for 3 hours or overnight. Allow the ice cream to sit out at room temperature for a few minutes to allow it to soften up before scooping. 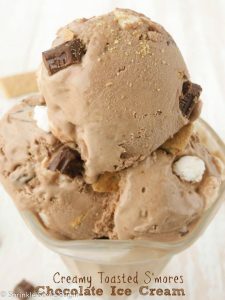 If you liked this recipe, here are some more ice cream recipes to try! Thank you so much for that healthy vegan recipe! I am trying to eat healthy and vegan (I am a vegeterian hoping and trying to become fully vegan) andI love banana ice cream. I will surely try your recipe using raw cacao and perhaps cacao nibs istead of chocolate chips!! I would appreciate some more vegan recipes! Have a lovely day, greetings from sunny Greece! I’m glad you like this recipe. We don’t usually publish vegan recipes because most of our readers don’t like them but we like to throw them in every now and then. We have a vegan chocolate mousse pie as well.